Studio Manager 17 is in the Works! We really never stop developing Studio Manager, but this time of year we are busy finishing off a new version – this time it is 17 to take advantage of the 17th version of FileMaker. Our Mac version is designed to fit on screens of 12 inches or more. 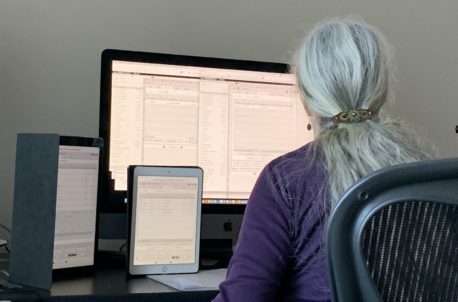 But on the iPad and iPhone sides, we have a few more screens to account for. In this photo, Scout is using an iMac Pro working on the Studio Manager 17 beta with an iPad Pro 12.9” and iPad 9.7” for reference. Thank God for 27” screens! We still put our top priority on the Mac version of Studio Manager 17 because most designers use big screen Macs for their design work and find it handy to use that same screen for Timesheets and task updates. And since creative services professionals hand down those big screened Macs to their Admin counterparts, big screens abound. But we’ve become mobile at every turn so lots of iPhones, iPads and MacBooks fill the gaps and they are so fast these days that we don’t count out exactly how much happens on an iPad, for example. Our database tool of choice, FileMaker, is fast, reliable and useful on all these devices. 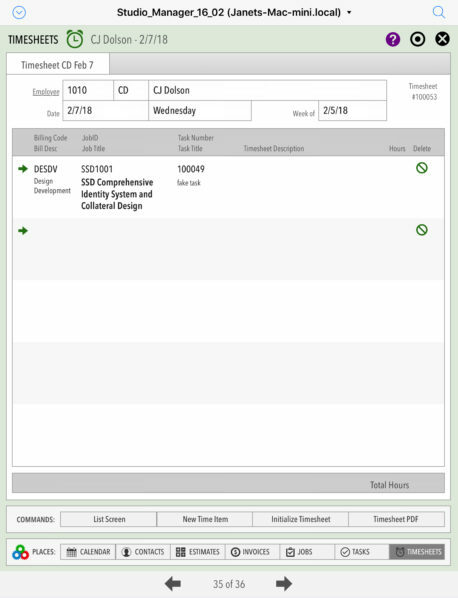 Almost everyone has an iPhone and iPad by now which means single tasks like checking contact information, looking up the status of a job, entering time and task status can be handled anywhere. When you aren’t in your office or at your desk, you still have access to your mission-critical information. Since FileMaker Go for iPhone and iPad is free and we usually use one device at a time, FileMaker’s licensing is by the concurrent connections, you can use all 3 devices as needed without blowing out your licensing limit. Studio Manager works on the basis of concurrent users as well, so you get maximum flexibility which in this world of devices is what we need. I’ve got work to do getting this version out the door, so will get back to you soon with other tidbits about what 17 will look like and also keep providing FileMaker upgrade help regarding which versions of Filemaker work with which versions of MacOS. If you have a PC, you are in luck in that certain versions of Windows 10, 8.1 and 7 are certified to run with FileMaker 17. Did I mention that there are more Windows users of FileMaker than there are Mac? Check out the details at FileMaker 17 Advanced Tech Specs. FileMaker 17 now runs well on the latest Macs running MacOS 10.14 Mojave and also on 10.13 High Sierra and 10.12 Sierra. This is the usual 3 MacOS Window FileMaker supports. We are close to finishing Studio Manager 17, but it is looking like an early February Release due to the demo, web and user manual updates we make once the actual product is done. We are shooting for early January for getting the new Studio Manager 17 demo up. Right now, though, you can try out Studio Manager 16 using our free full-feature Studio Manager 16 demo. We will be posting and updating screenshots from here on out. As always, don’t hesitate to contact us (TCG iPhone 415 789-5219) with any questions, comments or suggestions you have about any of the topics we cover on our site. FileMaker 17 Server and Pro received updates in early December 2018 to make them fully Mojave-ready. Like many other Mac users, we bought one of the great new Mac minis and it comes with Mojave installed. With FileMaker 17’s upgrades, you are now good to go with Mojave. We have FileMaker Server 17 running on our new Mac mini right now and have not had a single burp. If you aren’t quite ready for Mojave but think it is about time to upgrade to the latest and greatest FileMaker, know that FileMaker 17 is also compatible with MacOS Sierra (10.12) and MacOS High Sierra (10.13). In a pinch, I’ve managed to run FileMaker Pro 17 Advanced on a Sierra Mac and also run FileMaker Pro 11 (as a guest only). When my clients upgrade to 17, they often are coming from as far back as FileMaker 11 and I encourage them to run parallel briefly as they are converting and then customizing their new software. Apple is moving fast with their OS Upgrades these days (once a year), and FileMaker is right there with them with yearly upgrades. If you haven’t upgraded in a while, you might be shocked at how much better the performance is these days. One last thing about FileMaker and where it is going. At this Summer’s Developer Conference in Dallas, FileMaker Inc. leadership made it clear that FileMaker is focused on making it as easy as possible for end users to customize their apps. We are 100% on board as we’ve always been because each person, work group and company is different and keeps evolving. We are here to support you by making Studio Manager easy to customize and providing support as requested to help you or your favorite local contractor make it fit like a glove. Hi everyone. I have been hearing from some of my Studio Manager customers who have upgraded to High Sierra either voluntarily or because they bought a new Mac, that their Studio Manager database won’t run on FileMaker Pro 14 or lower. Actually, I haven’t heard from a FileMaker Pro 14 user yet about a problem, but FileMaker, Inc. says High Sierra is compatible with only FileMaker Pro 15 and FileMaker Pro 16. You can always try FileMaker Pro 14 and see if what you do with Studio Manager works but I recommend not bothering. You would be skating on thin ice. 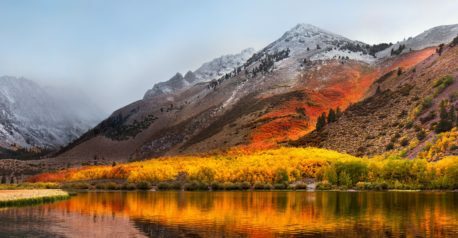 If you are stuck on High Sierra, spend the money and either upgrade if you can or buy one or more full versions of FileMaker Pro 16. By the way, FileMaker Pro is on an annual upgrade schedule that seems to be happening sometime in the Spring, so you may not be able to upgrade for free to FileMaker Pro 17 if you purchase FileMaker Pro 16 right now. However, the drawback of waiting until FileMaker Pro 17 comes out is (1) you have to wait and if you already have your new Mac running High Sierra that may be a problem for you and (2) brand new versions of FileMaker Pro are best left to the adventurers for a few weeks after release (say at least 6 weeks). That cautionary wait puts you into summer. Up to you. I have more on your FileMaker Pro buying decision in my January 30th FileMaker Pro 11 blog post. We’ve been running into problems lately with some of our Studio Manager users who have not recently upgraded their FileMaker (or Studio Manager) but may have bought a new Mac that requires High Sierra. FileMaker Pro 11 and new Macs. If you are still running the excellent, FileMaker Pro 11, you aren’t going to be able to install it on a High Sierra Mac. This is most likely a brand new Mac which will come with and require High Sierra. FileMaker Pro 16 won’t mix and match with FileMaker Pro 11. Needless to say, the current version of FileMaker Pro 16 runs fine on High Sierra. But FileMaker 12 or higher is incompatible with a FileMaker network running FileMaker Pro 11. This may be the owner’s new Mac. 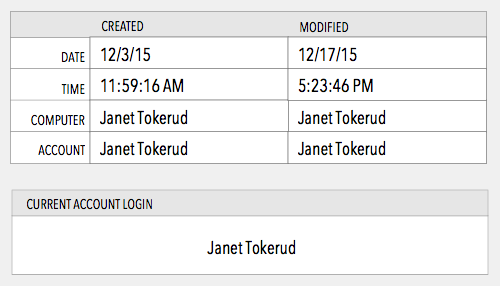 Not a good person to be locked out of your Studio Manager database. This could be an account manager. If you Can’t Upgrade to FileMaker 15 or 16. One option if you aren’t in the mood to upgrade your shop’s installs of FileMaker to FileMaker 15 or higher (which is recommended), is to use a second Mac that can run FileMaker Pro 11 for access to Studio Manager. You can Buy FileMaker One Year at a Time. Like a renewable subscription. That makes it affordable and flexible if you expect to upgrade more frequently than once every four years. Also, FileMaker team licenses are for numbers of concurrent users instead of by computer. That means if you have 8 people using Studio Manager, but not all of them use filemaker a lot, as few as a 5-user license could suffice. You will be limited if you want more than 5 users at once and will have to work around that limitation occasionally. You can learn more about upgrade pricing and whatnot by clicking the Buy button at the top right on filemaker.com. FileMaker Server Compatibility. If you do upgrade to FileMaker Pro 16, you can use FileMaker Pro Server 14, 15 or 16 to host for FileMaker Pro 16. I will be writing more about compatibility but wanted to get you something right now in case you run into this situation. Feel free to contact me for specific advice for your situation. Sorry this has taken until 4:21 pm PST to finish and upload our Studio Manager 16 Demo. But it is in very good shape and we hope you love it! Get the demo by filling in our short download form. You’ll like the product, the demo and the form which is super forgiving. It’s Saturday and I am going off the clock but call, text or do whatever you want if you have a question, request or comment. Our Contact Info and it is not a form!